Connecting Europe's Holocaust and America's Civil Rights movement, the film opens with Meisel recalling news coverage of a 1963 race riot in Philadelphia, sparked by a black family, the Bakers, moving into an all-white neighborhood. For Meisel, the scene was chillingly familiar. It was aired on numerous PBS-TV stations spring of 2000. The film is available for purchase, please e-mail for further information. 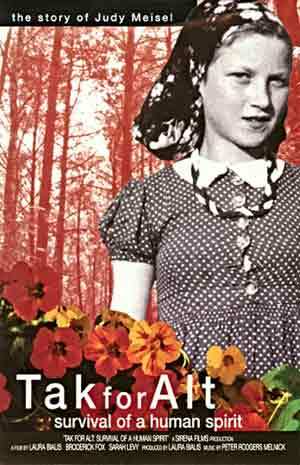 Unlike many Holocaust films that end with Liberation in 1945, TAK FOR ALT contextualizes these wartime events within Judy's continuing work as a Civil Rights advocate and educator, utilizing her experiences as a means to combat bigotry and racism here in the United States. The film underscores that the Holocaust is not just an historical event or a Jewish issue. Acts of intolerance continue across the world today, impacting people of varying color, religion, political affiliation, and sexual orientation. Through the film, Judy Meisel offers an example that one person can make a difference. Filmmakers Laura Bialis, Sarah Levy, and Broderick Fox met on the first day of film school in the fall of 1996, each with little hands-on experience, but a shared passion for the communicative potential of moving pictures. Nine months later, the three found themselves in the remote Lithuanian countryside, filming Meisel as she searched for her father's grave in an abandoned Jewish cemetary. Over the next six weeks, the three filmmakers continued on through Eastern Europe, following Judy as she retraced her steps of her remarkable wartime journey through Lithuania, Poland, and Denmark, before returning to the U.S. for additional interviews and entrance into post-production.